With style and structure inspired by J.R.R. 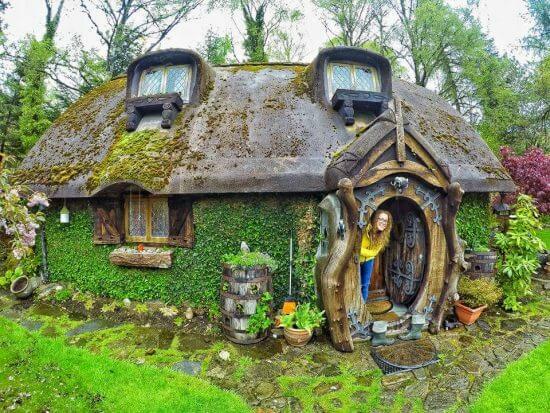 Tolkien’s “The Hobbit,” this delightful, cozy cottage seems to have emerged straight out of Middle Earth. Fantasy and reality collide in this series of recently revealed images. 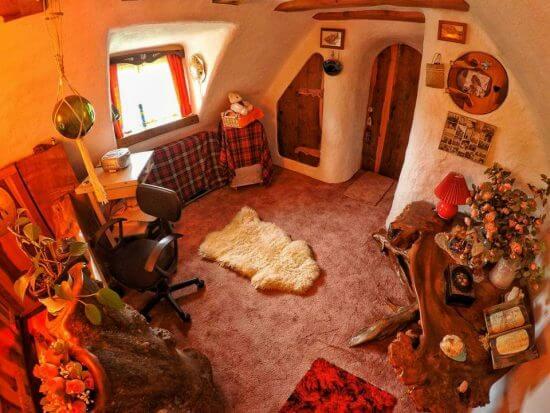 Imgur user Kahlum1986 shared several endearing images depicting the wonder and warmth of her uncle’s unique home. The clever craftsmanship and dedication to detail give the two-story home a very natural feeling. 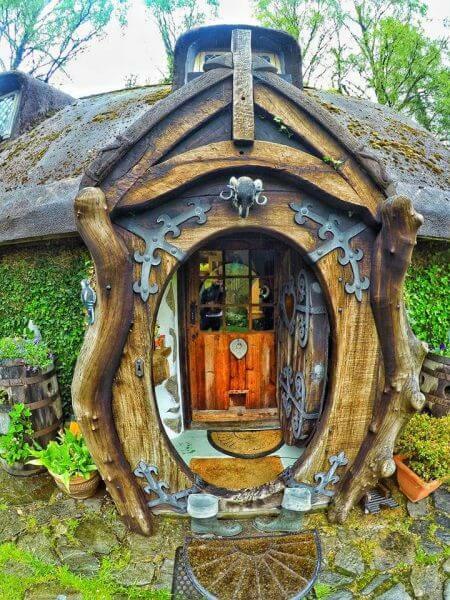 All that is missing is a member of the Baggins family serving second breakfast. 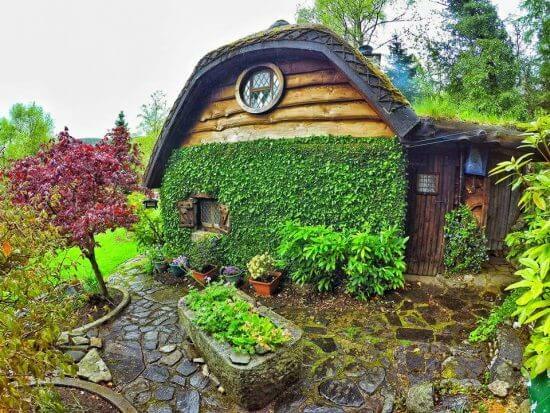 The photographic adventure begins with scenes of a quaint cottage covered in, and surrounded by, an abundance of greenery. Lattice windows peek from the grass covered roof on the second floor and large round door warmly welcomes visitors. 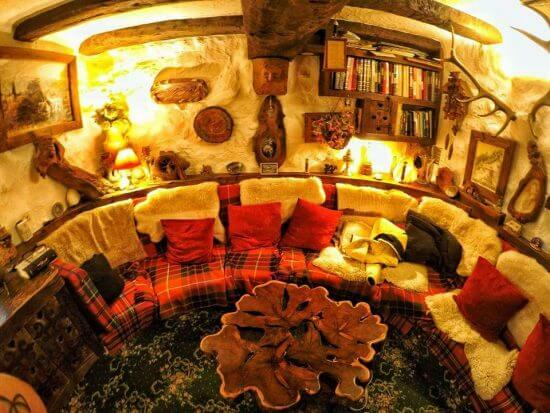 Warm, rustic elements on the walls and a large crossbeam introduce the living room. 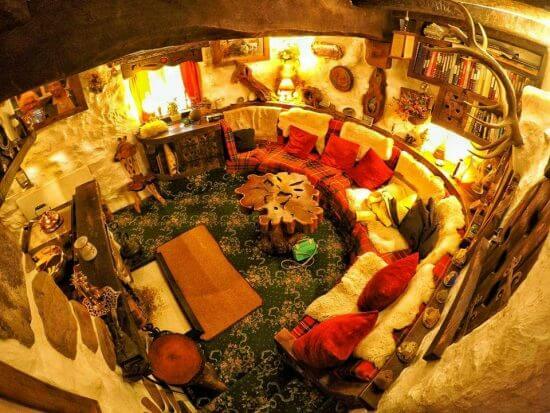 Curved, hand hewn end tables and window dressings add to the ambiance. 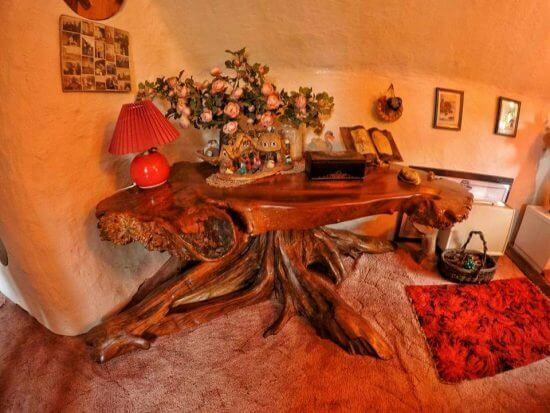 Surrounding a tree stump table, a very comfortable looking curved, couch creates an invitation to relax. Across from this is a small fireplace and counter, behind which hides a quaint kitchen. 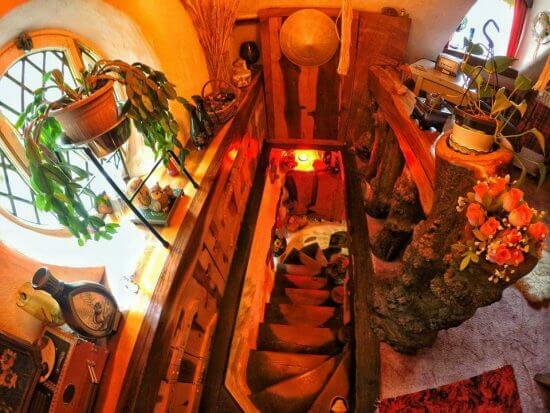 Adjacent to this, are stairs to the second floor. 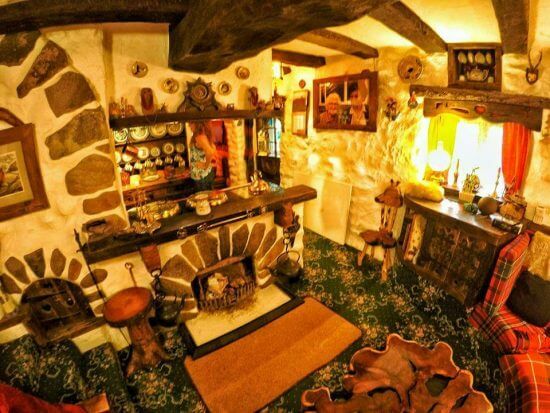 In the kitchen, the other side of the living room counter/fireplace reveals a wood burning stove. A double sink is set into a large wrap round wood counter. 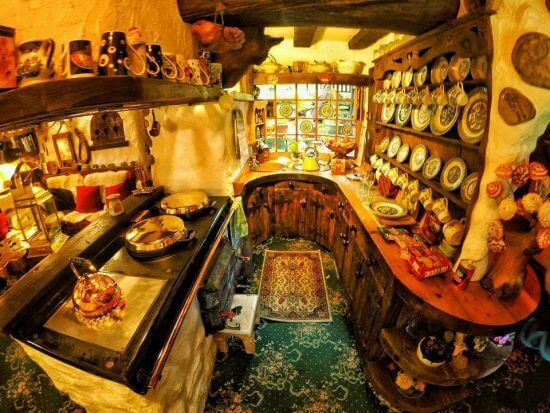 At the end of this counter is an open set of set of shelves displaying plates, mugs and more. 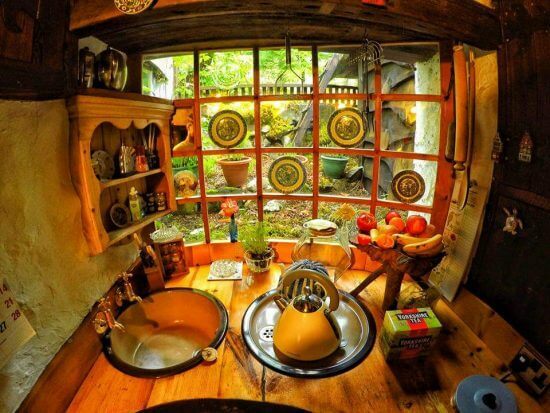 These are all illuminated by the large kitchen window behind the sink. 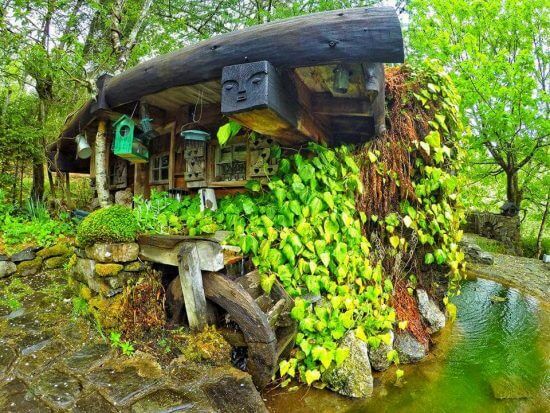 The home has two bedrooms. 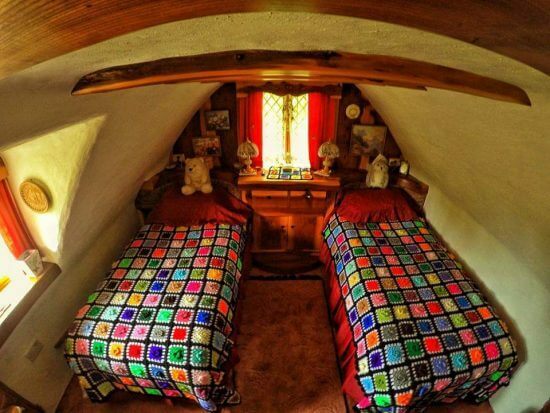 The warm glow of the rooms is complimented with colorfully crocheted comforters for each bed. 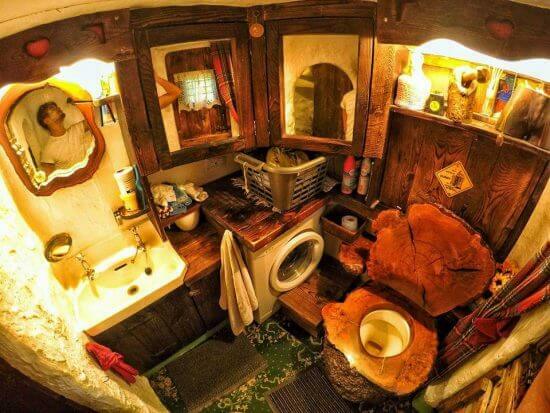 There’s also a combination laundry room/bathroom featuring a rather unique toilet. 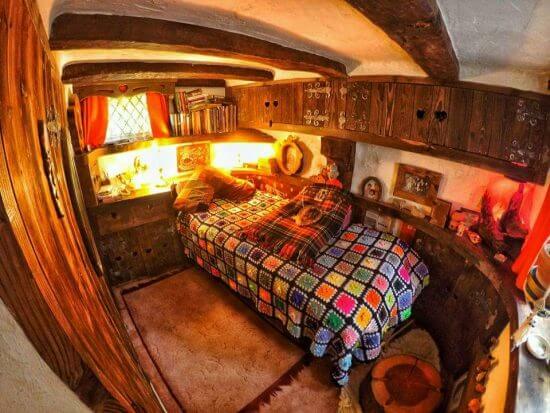 All throughout this amazingly crafted cottage is wonderful woodwork and enchanting, earthy décor. The surrounding grounds could easily be straight out of the Shire. 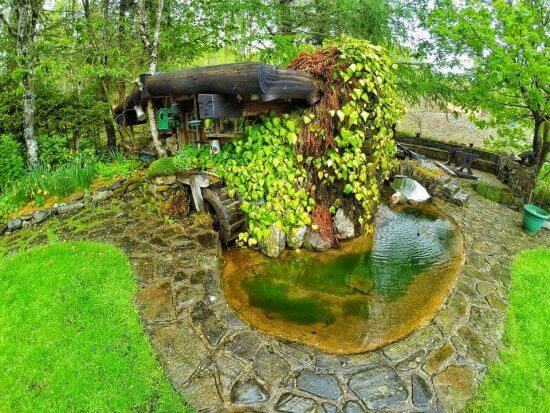 Wood picket fencing, path stones swallowed in grass, a tiny greenhouse, and even a small bridge covered pond complete the picture of pure relaxation and simpler times. 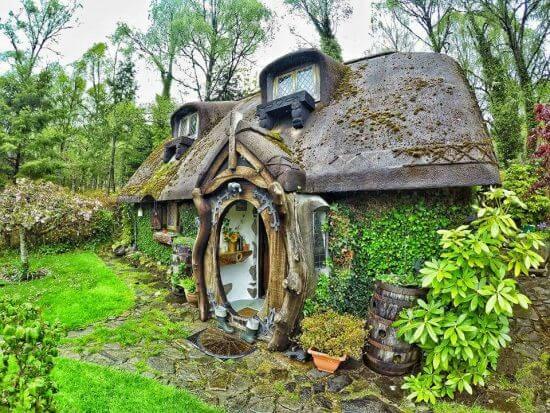 A lot of love and time went into this magically enchanting environment, as evidenced by the delightful details inside and out of this happy Hobbit-inspired home. It’s almost as if Peter Jackson was waiting just out of frame to direct another shot.